There are several ways to access Green Mountain with varying degrees of difficulty. One popular route is via the Greenman and Ranger Trails. The Green Mountain Loop Trailhead begins part way up Flagstaff Road. 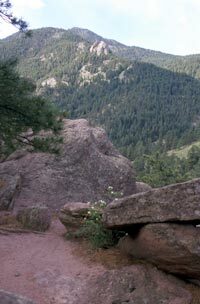 Following the Ranger Trail up through a pine forest, you will get the occasional views north over to Mount Sanitas and west to the Indian Peaks. Part way up the trail it meets the Greenman Trail. At this point you can stay on the Ranger Trail, following it the right and up the Green Mountain, or you can take a left on the Greenman Trail, which you take across a creek and climb up a series of steep switchbacks to the summit. Either way you will end up at the peak of Green Mountain with views of Boulder, the Indian Peaks and the plains. When you descend follow the trail you didn't follow on your ascent.